Measure the ingredients for all of your favorite recipes with this Cambro 400MCCW135 Camwear 4 quart measuring cup. Made of strong, virtually-unbreakable polycarbonate material, you can be sure this measuring cup will not dent under everyday use. It features a molded-in handle that will not break off, in addition to externally marked graduations for an accurate measurement every time. We have many Cambro products and have not had any issues with any of them! All their items are durable and multi-functional. We have had some items for over 10 years with daily use. This four quart measuring cup has worked great for years! Very durable plastic and the writing on it has not worn off or faded. Would definitely recommend. There are a lot of different options for measuring cups but we prefer these Cambro ones. They are durable, easy to clean, and are easy to read and see how much you have in them. Such a great product. The numbers on the cup is very clear and easy to read. And also this measure cup is easy to clean. Highly recommend! These are easy to clean. Come in handy for transporting a quantity of products, especially in a busy restaurant when you're making gallons of soups at a time. We bought 3 sizes of the cambro measuring cups. We've been using these for many years but I think I would look for another brand. These new ones feel a little flimsy and the grip is longer, making it hard to balance the larger cups and pour without spilling, particularly if you have small hands. Would recommend more comfortable grips that shape to the users hand and easier to read measuring methods on the cup. otherwise easy to use and great for everyday use. We usually use this measuring cup, or should I say pitcher, to measure water to do our cold brew coffee without having to take the larger bucket from the place where it stays most of the day. A couple of trips to the filtered water dispenser with this measuring cup sure beats moving the really heavy bucket. This is a GREAT measuring cup! The numbers on it are nice and easy to read. It is a very heavy duty sturdy measuring cup. Highly recommended! We use these constantly and they're holding up great. We use them for both hot and cold liquids with no problems. These are sturdy and well-made and will be our go-to anytime we need more measuring cups. We cannot live without this 4 quart measuring cup. Without it we would have to measure our large batches of baked goods with the itty bitty regular cups. This really saves the day. It's super durable and put up with all of our abuse. This is a good quality product. It's sturdy, durable, and doesn't break when dropped. It's easy to wash and the numbers are still intact after hard use. Good buy! We have used this item to measure our ice cream liquid ingredients. The measuring lines are clearly marked and easy to read. If you need to have 1/2 cup or smaller increments though, I would not recommend this item. It only have full cup measurements. We love these for everyday use, and we use it for everything. Rinses out well and very very durable. The price is just rite for this pitcher ?? Best measuring cup you can buy. Cambro is great. They are NSF and really strong. When you are looking for really good pans or lids go with cambro. Its the best. Easy to read and clean. Able to handle hot liquids really well. Durable enough to withstand falls from 45" or so. Print starts to fade after awhile, but by then it's usually time to retire it to the garden or shop. This 4 quart measuring cup is perfect for everyday use. It cleans up nicely and doesn't crack easily. We have already bought more of them. This camwear Cambro measuring cup is a big one. I use this measuring cup when I have a big order to fill. The easy to read gradations make it a breeze to measure my liquids. We were just eyeballing some things like water and oil using a water pitcher for the longest time, but switching to these measuring cups made a huge difference. So much easier. Worth every penny. Fantastic measuring cup. I ordered one, and liked it so much that I got two more in that size and one of the 2 quart versions. I make soap, and these are heavy enough plastic to stand up to lye and raw soap batter, but not glass that could potentially shatter. Cambro is always a great choice in our restaurant. With the quality you can expect from a Cambro brand product, the 4 quart container stands the test of time when holding heavy liquids on a daily basis. Excellent Cambro product! It makes a difference to buy the measuring pitchers with continuous handle so it doesn't break off or crack with continued use like cheaper models. Easy Pour spout, easy to see measurements on the side, handle that doesn't break off, can be used for boiling hot liquid and put in freezer. Can be put in dishwasher, very durable! These pitchers are great! Last a relatively long time, easy to clean and don't crack as soon as you get them like others. They are perfect for restaurant use. Very durable and easy to store, large enough to use for larger food orders and easy to clean. Would definitely recommend to other businesses and purchase again. This is a great measuring cup. We make A LOT of homemade BBQ sauces and dressings, so having large measuring devices is essential. We use this as our standard liquid measurer -- it's huge! We also use this for a catch-all container for water (filling our chafing dishes, etc). Durable too! Must-own product. Numbers are extremely easy to read and they do not fade after several washes like most. We use it everyday from measuring water for our mixes, filling our water dispenser among other uses. We have also dropped it several times and it doesnt shatter or chip...excellent product. The cambro measuring pitchers are the best. The plastic remains crystal clear for years, the writing on the side doesn't fade, and the handle won't fall off. The only liquid measure you will ever need! I bought one of these for the bakery, we don't use it often however it is nice to have this size around when you need it. Love these measuring cups. We use them for all types of mixing and they are so much cheaper than our local supplier even with shipping. This measuring cup is really handy because of the large spout and handle. It's capacity allows me to measure my liquids so we don't have to run back and forth to the fridge. We have not dropped it yet but the plastic seems to be pretty strong and durable considering how we fill the measuring up to the top and the handle is still intact. Well constructed item with clear markings. These are solid pieces and should last a long time. We would definitely buy these again and also recommend the product to others. Finally a big measuring cup. I use it with hot water (160F) and have had no problems. Didn't crack at all. (I use it for homebrewing). Don't know what I would do without these. This is the 4th one I've purchased for my store and catering business. Strong and durable as well. Durable, Strong, Accurate. Everyone knows these things get tossed around and beat up pretty good, there is no difference at my kitchen and I give this product a 6 star review if I can. This is a great, large capacity measuring cup. I find it pours very cleanly, and it has a nice large diameter so I can easily use a strainer with it. These are solidly made! We use every day for measuring water/liquids for our dough and cinnamon rolls. Will stain/numbers fade after heavy use but that is to be expected. I have been using this brand of measuring container for years and they are well made. If you put boiling hot liquid in these they won't melt or crack. You won't find a higher quality measuring container. Very well built cup. Nice and sturdy. The only thing I would prefer was if there was a little more space above the top measurement, to avoid it from spilling when moving around with the cup full. 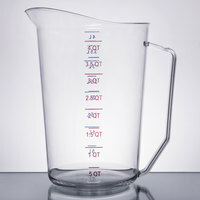 Great measuring cup as it is made of a nice solid plastic and does not feel cheap or flimsy. Came exactly as pictured and I love the brand of cambro as they make very high quality products. The four quart cambro is light weight, heavy duty, and has easy to read metric and standard markings. I\'d like something similar that is less sensitive to heat, but this works great for measuring water for our soaps. This is a great pitcher to pour my juices and measure! Very sturdy - I will be ordering more sizes as these are perfect for my business!! I haven't used this to measure liquids. A popular bread recipe asks for six cups of flour to be added, all at once, to the wet ingredients. The flour is easier to manage when I measure it into this measuring cup instead of into a mixing bowl. Flour pours quickly with no mess when its time to add it to the dough. This is a great large measuring cup! It is good for large batch baking!! Excellent for water, milk and any liquid ingredient! Great price and high quality!!! These are a necessity in every kitchen. Measuring what you do helps to control food cost and ensure that nothing gets messed up! got to have it! Measuring liquids in this container is super accurate. Use it all the time for baking items as well as making salad dressings too. Plus great price. This large measuring cup is perfect . I love how easy it is to read the measurements. It is very durable and will hold up for all your measuring needs. I don't think you can go wrong with cambro measuring products. The plastic is very clear and stays that way through many washes (though eventually it clouds). The writing is bright and easy to read. The design looks a little fragile like the handle might break off, but so far ours have been very durable. Love this 4 quart measuring cup! The markings on the outside are easy to read and the measuring cup is nice and sturdy. Perfect size when I have to make larger quantities of foods. These work very well. The markings are very easy to read. The handle is strong and we're very pleased with the Cambro measuring cups we've purchased. Love these pitchers. We tried another pitcher with a base but the base eventually cracked and fell off. These are pretty traditional, not a lot of style, but will last longer.